Grace Zumwinkle comes in at No. 15 on our list of Minnesota’s top 25 players of the last 25 years, but with more time to develop her career could have her in the top 10. The 2017 Breck graduate was a five-time all-conference recipient, was named to the all-metro team three times and also tripled up on all-state awards. Her senior season she was named Ms. Hockey after scoring 42 goals and 58 points. At the University of Minnesota she stepped right in, leading the WCHA in scoring and leading the team with 38 points. This season she is having another great year with 36 points in the team’s first 28 games, including 21 goals. She is also a two-time gold medalist for the USA Women’s Under-18 Team. Amber Fryklund is one of the pioneers of girls’ hockey in Minnesota and was part of a group of girls who exploded on the hockey scene in its early years. 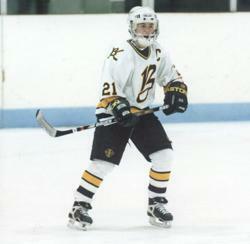 Fryklund was a dominant high school player for Hibbing where she graduated in 2000 and was a Ms. Hockey finalist. She joined Bemidji State University where she became the school’s all-time leading scorer with 122 career points. Shortly after graduating she coached high school hockey in Duluth before returning to Bemidji State where she has served as an assistant coach since 2011. Erica McKenzie’s hockey career began in a modest program in Hastings, where she helped grow the program from its infancy due to her innate abilities on ice. 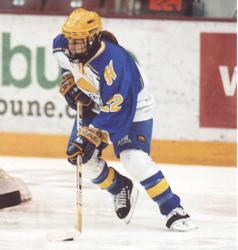 Her prowess on the high school rink led her to the 2004 Ms. Hockey Award and also earned her a chance to play with the University of Minnesota where she starred for four years, garnering 144 points as one of the program’s most dynamic players, helping lead the team to a national title her freshman season. After her collegiate career she played with the US National Team where she helped lead them to a gold medal win over Canada in the Four Nations Cup. A knee injury eventually ended her career, but today she is still involved with hockey, working in fan relations for the Minnesota Wild. Wherever Anne Schleper played, whether at St Cloud Cathedral High School, the University of Minnesota or Team USA, she had a lasting impact. At Cathedral she was named a Ms. Hockey finalist and scored 26 goals her senior season as a defenseman. She was also a two-time member of the U.S. Under-18 National Team, winning gold in 2008. At the University of Minnesota, she would set the career record for games played with 159. The blueliner helped lead the Gophers to a national title and was an All-American and two-time All-WCHA member. A longtime member of Team USA, Schleper was a part of three teams that won gold medals at the World Championships. Laura Slominski was a standout forward in the early years of girls’ high school hockey in Minnesota. As a sophomore in 1996, Slominski helped Burnsville to its first state tournament appearance where the Blaze took home runner-up honors. Two seasons later, she captured the third annual Ms. Hockey Award to cap an illustrious high school career. From there, Slominski went on to an outstanding career at the University of Minnesota, winning a national championship in 2000, serving as a team captain and a top-10 Patty Kazmaier Award finalist accolade in 2002. After graduation, she moved behind the bench, coaching at St. Olaf, St. Cloud State and the U of M before leading Edina High School for eight seasons, six of which culminated in state tournament appearances.